Shape-shifting protein might shed some light on the disease. The medical field has slowly been making headway in battling Alzheimer’s, and a new paper published by the Journal of Biological Chemistry could contribute to them beating the disease once and for all. A key player in the development of Alzheimer’s has already been pinpointed: amyloid beta. A familiar name to those who have encountered Alzheimer’s, this protein is neurotoxic. It interferes with synapses, which effectively severs connections between brain cells. Fragments of amyloid beta also accumulate, forming plaques that lead to more drastic declines in brain function. In the new paper, researchers from Washington University in St. Louis (WUSL), along with some German collaborators, note that they have found that amyloid beta actually transforms its structure in order to gain access to neurons. “What we found is that this structural change is required for the Abeta (amyloid beta) to enter neuronal cells and that single non-aggregated Abeta molecules first aggregate and change into beta-sheet structure before they are taken up – not after,” WUSL assistant professor of biomedical engineering Jan Bieschke told New Atlas. The question of how the amyloid beta protein gains its toxicity is still up for debate. 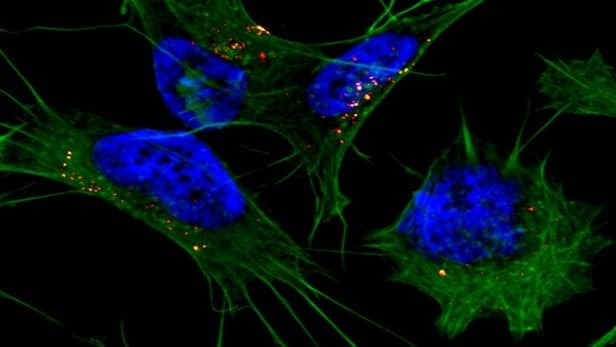 Scientists have speculated that it impedes the function of neural mitochondria (“the powerhouse of the cell”), cutting off the energy supply and leading to the death of affected brain cells. Having determined the mechanics of amyloid beta’s entry into the cells, Bieschke plans to investigate the possible interaction between amyloid beta and the mitochondria, as well as the potential of influencing the entry or accumulation of the protein. “This may be a therapeutic strategy to help future patients with Alzheimer’s,” he said. According to the Alzheimer’s Association, Alzheimer’s is the sixth leading cause of death in the United States, while more than 5 million Americans are currently living with it. Without medical breakthroughs to stop Alzheimer’s, experts believe that it could affect as many as 13.8 million Americans aged 65 and above by 2050. The research conducted by the team at WUSL and others around the world is essential to determining how we battle this disease, be it by making changes in our environment, formulating new medications, or pinpointing ways to mitigate the symptoms. With enough minds working together, Alzheimer’s could one day be a disease we’re happy to forget.